St. Martin's Press, 9781250087102, 416pp. But Serial did not tell the whole story. In this compelling narrative, Rabia Chaudry presents new key evidence that she maintains dismantles the State's case: a potential new suspect, forensics indicating Hae was killed and kept somewhere for almost half a day, and documentation withheld by the State that destroys the cell phone evidence -- among many other points -- and she shows how fans of Serial joined a crowd-sourced investigation into a case riddled with errors and strange twists. 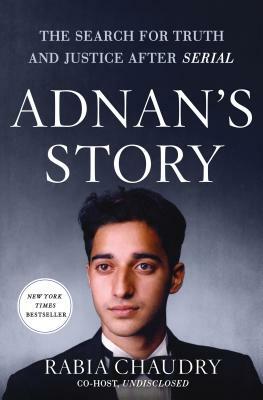 Adnan's Story also shares Adnan’s life in prison, and weaves in his personal reflections, including never-before-seen letters. Chaudry, who is committed to exonerating Adnan, makes it clear that justice is yet to be achieved in this much examined case. RABIA CHAUDRY is an attorney and partner at Chaudry & Anwer Immigration Law, a recent Jennings Randolph Fellow at the U.S. Institute of Peace, an International Security Fellow at the New America think tank, and a Fellow of the Shalom Hartman Institute. She is the co-host of Undisclosed, one of the top-ranked podcasts in the iTunes store with nearly 250 million downloads, and The 45th, with over four million downloads. She is a member of the National Muslim-Jewish Advisory Council and the Aspen Institute Vanguard Board. She is a frequent public speaker, and her writing has appeared in numerous outlets including Time.com, The Huffington Post, and the Chicago Sun-Times.